Our guests come from all over the world and on this page we've reproduced extracts at random from just a very few of the comments they have left behind after their holiday with us. The comments have been taken from our Guest Book and from the feedback form which every guest is asked to complete prior to departure. The original comments can be examined on request. 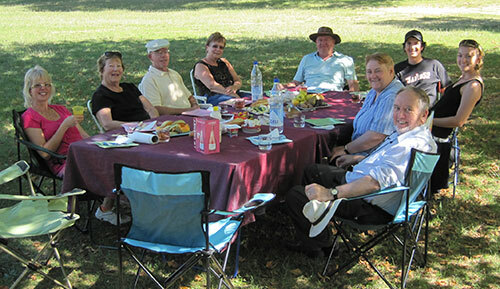 A group picnic lunch at Barbaste in southwest France with Painting Photography France . Jill is famous for her fabulous picnic lunches by the way! Guests participating this time were from southern California and north Washington state in the USA, and from Cheshire and Hampshire in the UK. We called it our 'Hands across the water' week! "The week went way beyond an advanced photography workshop. I knew I was going to learn a lot and I'd hoped to have a great time, but it went way beyond my expectations. Pete is a fantastic teacher; he knew so much and taught us so much. Honestly, I can't come up with the right words to describe how I feel about that. The food was outstanding (particularly loved Vétou's) and Jill's picnics were delicious (gave me inspiration!). You all have a wonderful concept that really works. It went way beyond a 'photography workshop', it was also an insider's view of life in the Lot-et-Garonne, using an artist's perspective. Ingenious! I would have been prepared to pay much more for this experience because it really is worth a lot more. "Thank you both for a truly wonderful week! We enjoyed the lovely locations and we've certainly increased our knowledge of painting and photography. Great food, good company, and we had fun! Looking forward to visiting you again!" "The individual attention was excellent and the level of experience extraordinary. The design and perspective I learned for my painting was worth the whole trip." This week has been a very happy experience, I loved it. I loved Jill's expertise and I loved your generosity and kindness. It was a great learning experience as well as a great holiday. "What a great week - rarely have we laughed so much! Wonderful restaurants, an excess of wine, and superb tuition in both painting and photography! Thank you both so much for all your kindness - and for being so much fun." "Jill and Pete you are the perfect hosts in a beautiful home in glorious SW-France. I could not have ordered a more perfect week. Every aspect has been a joy - from your unrelenting attentiveness, to fantastic company, to brilliant and patient photography tuition. Would love to return sometime and enjoy this lovely experience again." "This is our third painting and photography holiday - pity we didn't find you first!" "Wow! Thank you Jill. Your knowledge, manner and patience are great. Your passion for art, composition and colour has been so inspirational and a breath of fresh air. I have learnt so much this week. I now see the world in a different light! I have rekindled a passion for painting and art thanks to you Jill. Your advice and words of encouragement have meant so much to me. But equally what you offer as warm, welcoming hosts is so special.... a lovely retreat where your passion for comfort and homely, yet historic, understated luxury is pure medicine for the soul. THANK YOU!" "Brilliant! I learned more about cameras and the art of photography in one week than in the previous fifty years... and I've got the pictures to prove it! "The whole week has been a fantastic experience. Jill and Pete, you were great. It's been far more than just a painting/photography experience. We've sampled the true flavour of the country in more ways than one. Vétou's night was brilliant! "We've had a very lovely week learning many new techniques for painting and photography from you. We enjoyed your style of teaching and all the beautiful places you took us to. Thank you! "Thank you for a delightful week. I have thrived on personal tuition from Jill - fabulous. Brilliant hosts, wonderful places we visited, and great food. SW France is fabulous. Hope to come again. "Pete's tutoring was of a very high standard. He could not have been more patient!! His expertise and vision really helped me to start on a journey developing my skills and becoming friends with my camera. In fact it was so good I came back a second time!" "I learnt more about proper photography in the first two hours than from reading dozens of mags and manuals. And the rest of the week was just as brilliant! Thanks Pete and Jill for the great planning, fun, touring, eating and drinking. Excellent! "Jill is a patient and sensitive teacher with a very good knowledge of water colour painting and painting in general and can pass that knowledge on in an easy to understand way. Thank you for a fantastic week! Great accommodation, great food, wine, sights, villages, markets and, of course, great company! If you have enquiries from other Aussies and they would like to speak to another Aussie who has been to stay, please don't hesitate to give them my email address. I would be more than happy to let them know how fantastic the whole experience has been for me. Thanks again!" "Far beyond what I expected in standard and subject matter. A lot to take in but the practice was set at a good pace and good humouredly taken - noticeably kind and patient. Pete's knowledge of each camera's tricks is admirable. Pete and Jill, you are a lovely couple. You made this week one of the happiest weeks I have ever had. Your kindness, gentleness, good humour, wonderful accommodation and amazing meals have made it a week to treasure." "Pete and Jill you are very special people. I feel here like being home. Pete is a very experienced photographer and knows how to teach so everything was just perfect! We had a very special group and a very friendly atmosphere. This was an unforgettable experience for me. Muito obrigado! Com afeto"
"A wonderful week, lovely hosts, much fun and laughter. Thanks Jill for the very filling picnics! Your instruction was inspiring. I must save up to come back when the sunflowers are out! THANK YOU!" "Superb, just what I wanted. Changed my approach to photographing completely. Can't wait to put it all into practice! "All the restaurants were fantastic. Food and service excellent in every respect. The painting course rekindled an interest from my school days - one I intend to carry on with. Thanks Jill! "Top week! Great hosts! Great guests! Much laughter! Changed my whole approach to picture taking. Thank you Pete!" "A superb holiday and painting week. Great food and accommodation and very friendly hosts who go out of their way to make you feel at home." "Great food! Brilliant company! Excellent tuition - my photography knowledge improved far beyond what I might have anticipated. This holiday is made by the attention to detail from superb hosts. Highly recommended!" "A huge thank you to Pete & Jill for all their effort in making this a really wonderful experience. The first holiday ever on my own has been one of the best, with beautiful scenery, good food, great teaching from Pete (and tourist guide!). Also meeting lovely new friends. Great company! "Thank you for a lovely painting holiday which I know from experience compares more than the norm. Well done!" "Pete, you have been great. It has been so good to have a week out taking photographs with someone who does it for a living. 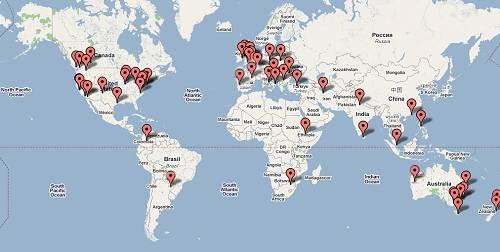 I have learned a lot from you so thank you for all the comments and for finding so many locations for us. We have seen so much of this wonderful area." "The painting experience was great. You could not have been nicer or more helpful. As an experience, everything was wonderful. Water colouring is a new experience for me and I had a great teacher. You are both great guides and very helpful hosts. Wonderful restful week. Wonderful lunches and thanks to Pete and his Band for a memorable birthday! " "Pete is a great photography teacher; he knows how to make things easy to understand. I loved the relaxed atmosphere during the day and in the evenings. Thanks for a great week!" "Thank you for an awesome time! The food and accommodation could not have been better. Great atmosphere! We'd love to return your wonderful hospitality if you ever get to NZ!" "This was a perfectly lovely photography holiday - way beyond my expectations! Jill and Pete, you did everything possible to make me feel welcome. Je vous remercie! If anyone wants a recommendation, don't bother checking with me, just go right ahead and give them my number! " "Outstanding! A truly memorable photography week with some special hosts in a picturesque pocket of France. Felt I learned a lot and it has "fuelled the fire". Felt at home on day one which is a tribute to your hospitality. Very impressed with the professionalism. Rooms are immaculate. Loved the picnics! Cheese, bread, paté, olives, rosé. Tear me off another piece of baguette! "Jill and Pete, thanks for a fantastic week. The painting and photography was just great! Great food and great company also! We certainly envy you your lifestyle here in your French Paradise. And we had all the accents covered - English, Scottish, Irish & Canadian! Thanks again for a week we will always remember (and hopefully repeat!!) "
"Thanks Jill and Pete for a fantastic holiday. Great tuition, hospitality and company. Had a lot of laughs and feel very relaxed." "All was at a higher standard than anticipated, including the picnics!! Five stars for every meal! The diet starts tomorrow! We learned so much from lovely hosts. A great holiday in beautiful surroundings." "Thank you so much for welcoming us into your home. You have given us a week of great food and wine, treated us like family, showed us all the wonderful towns, villages and scenery and taught us both lots about painting and photography. We liked the informal way you presented topics. We couldn't have wished for better hosts or a better welcome.. It was excellent value for money. We've had a great time and we're sad to leave you. Thanks again. " "Many thanks to you both for making the past week so enjoyable. The accommodation and meals were "top class" in a lovely relaxed atmosphere. Very best wishes for your business; it can only flourish!" "Such a pleasure to sit back, relax and enjoy beautiful countryside, good fresh food, in such a lovely atmosphere. We have both learned so much this week and have enjoyed the holiday so much we would dearly like to stay on. Many thanks for your patience and effort. You may well see us again! Diolch yn fawr iawn." "A grand and unforgettable week with well informed and caring hosts in such a delightfully photogenic area. Very high standard of organisation with the flexibility to adapt to our individual needs was very much appreciated. Your kindness, friendship, and consideration are something special that I will not forget. An experience we would be happy to repeat anytime." "A great week! Just what I needed, spending time in such a beautiful region and with such excellent hosts. Thanks for the impromptu rock band rehearsal, it rounded off a memorable time!"